Link: This unit being located in the Shetlands wished to adopt as its badge a Viking ship to symbolise the very long association of these islands with the Norse Kingdom. The sail is charged with a flash of lightning to denote the signalling functions of the unit. Although the unit changed its name to RAF Stn Saxa Vord in September 1984 there is no record in the Badge Register of itshaving been assigned an official Close Copy of the badge. Motto: Praemoneo de Perculis – I give advanced warning about danger. 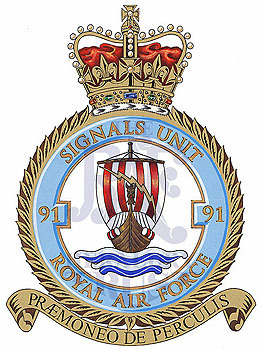 History: No 91 Signals Unit formed at Saxa Vord on 31 March 1955 and was renamed RAF Stn Saxa Vord in September 1984. It closed on 1 April 2006.